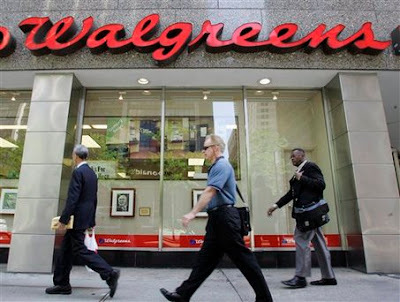 Walgreen Co. (NYSE: WAG), the largest US drugstore chain, is scheduled to release its fiscal third-quarter earnings before the opening bell on Tuesday, June 21, 2011. Analysts, on average, expect the company to report earnings of 62 cents per share on revenue of $18.33 billion. In the year ago quarter, the company reported earnings of 51 cents per share on revenue of $17.20 billion. Walgreens is the nation's largest drugstore chain with fiscal 2010 sales of $67 billion. As of May 31, Walgreens operated 8,171 locations in all 50 states, the District of Columbia, Puerto Rico and Guam. That includes 7,714 drugstores, 192 more than a year ago, including 23 stores acquired over the last 12 months. The company also operates worksite health centers, home care facilities and specialty and mail service pharmacies. Its Take Care Health Systems subsidiary manages more than 700 in-store convenient care clinics and worksite health and wellness centers. In the preceding fiscal second-quarter, the Deerfield, Illinois based company's net income was $739 million, or 80 cents per share, compared to $669 million, or 68cents per share, in the prior-year quarter. Revenue grew $18.50 billion from last year's $17 billion. Analysts, on average, expected the company to report earnings of $0.80 per share on revenue of $18.38 billion. At its last earnings call in March, Walgreens said that it expects organic store growth of 2.5 - 3 percent in fiscal 2011. Early in May, the company said that total sales for the third quarter of fiscal 2011 were $18.38 billion, up 6.8 percent from $17.20 billion in the third quarter of fiscal 2010. Comparable store sales for the third quarter of fiscal 2011 increased 4.1 percent, while front-end comparable store sales for the quarter increased 3.9 percent. Prescriptions filled at comparable stores increased 4.5 percent in the third quarter and comparable pharmacy sales increased 4.2 percent. The company is steadily improving its cost structure. The company has been able to cut back on profit-sapping promotions as it has improved its merchandise assortment and kept inventory under control. The company also has been slowing down the pace of new store openings and converting thousands of stores to a new, streamlined format that reduces some of its pharmacists' administrative workload so they can spend more time talking with customers.It has also added various products to its offering including beer and wine. Recenrtly, Walgreen completed the divestment of its pharmacy benefit management business to Catalyst Health Solutions for $525 million in cash. Walgreen also completed the purchase of Drugstore.com Inc. during the quarter. The move is intended to bolster its online health and beauty business.